There is just something about getting out of the city that seems to inspire creativity. Society today is on a constant treadmill with little time to stop and enjoy the view. This is particularly true when it comes to business conferences. There is no denying that a business conference can be impactful and beneficial. However, they can just as easily fall into the trap of ‘time-wasting’, where very little is achieved. While it is often convenient for organisers to plan events close to the city, this can sometimes backfire as delegates try to pop into their offices or rush in and out to nearby meetings. Sometimes the best way to have a captive audience, is, well, to keep them captive. A country or bush lodge with conference facilities is a great way to do this. Not only does this make the best use of South Africa’s natural beauty and infrastructure, but event organisers can create some truly memorable events away from it all. As an event organiser or company hosting a business conference, you want to ensure that you get maximum benefit for the cost outlay. This means that you need your conference to be productive and beneficial to all involved. Graham Oates, owner and founder of the Nutcracker Country Venue, on the banks of the Vaal River in the Free State, says that one of the major contributing factors to the success or failure of an event is the conference centre itself. “It is vital that you select the right location to create the perfect atmosphere for your delegates, which is why a small, intimate venue is always a great choice,” he says. Country lodges and bush getaways usually cater to smaller conferences and business groups, which minimises the overall hassle that accompanies such event organisation, and making the conference more worthwhile for the delegates. “With personalised service and increased networking opportunities, intimate conference venues are definitely a winning option,” says Oates. Janie van der Spuy, PR Manager for Mhondoro Safari Lodge and Villa, less than three hours’ drive or a 50-minute flight from Johannesburg, says that safari conferencing is becoming more popular as the demand rises for busy executives to escape to a venue that is conducive to creative thinking, where there are no interruptions, and where business can be mixed with some relaxation. Promotes discussion A smaller conference venue means that delegates can engage in a productive manner. “Where vast, expansive conference halls are suited to guest talks and lectures, many delegates who fear addressing large crowds might shy away from sharing valuable insights with the rest of the conference attendees in such intimidating surroundings,” says Oates. Privacy is key Business conferences often contain sensitive information in the subject matter. By hosting your conference at a smaller venue, you may find that you can have exclusivity and ensure privacy. On-site accommodation Country lodges and bush venues often have their own small conference venues on site. This is suited to those conferences taking place over two or more days, and allows for other activities to be included. Networking opportunities Smaller venues not only encourage delegate engagement, but also help to create networking opportunities within the official (and unofficial) conference programme. “The inclusion of teambuilding activities and more relaxed social interaction further encourages such networking,” says Oates. Personalised service Venues that cater to smaller groups tend to create a better sense of connection between guests and staff, and allows for a more personal service. “This makes for a much more enjoyable experience for all, further increasing the chances of conference success,” says Oates. Tailored packages Bigger venues may only offer set packages, where smaller, more intimate venues can tailor packages for your needs. So the small, but important, aspects of a conference will be addressed as flexibility is usually an option. Budget-friendly These facilities can generally adapt their services to cater for any budget, which makes it a more cost-effective option. Plus, as you can tailor your event to your needs, you can ensure that you get exactly what you want out of the event. There are a number of reasons why offsite brainstorming sessions are good for business. Boosts employee connections By taking your team out of the traditional office structure, you are more likely to encourage them to share their thoughts more honestly in a relaxed, neutral environment. Encourages teambuilding Often country lodges and bush venues have a plethora of teambuilding activities as part of their offering. These can either be based at the venue itself or outsourced. “Teambuilding events really do serve to strengthen work relationships by displaying other strengths – and even weaknesses – that may not be evident in a traditional office setting,” says Oates. Change is good By having a business conference in these surrounds, delegates are more likely to see things from a completely different perspective, which in turn, benefits the brainstorming sessions. Press reset The same thing day in and day out is not going to inspire any creativity. In fact, getting into a rut can result in repetition, which can cause ideas to stagnate. With wellbeing continuing to be a major trend, there are a number of benefits for both organisers and delegates regarding hosting your next event at a country or bush venue. Improved short-term memory You want delegates to take in the information shared. Being in a natural environment will help boost memory retention. A study, conducted by the University of Michigan and published in Psychological Science, found that those students who took a walk in nature after studying were able to retain more information than those who were in a city environment. Suggestion: Include a bush drive or nature walk as part of itinerary. Boosts mental energy Avoid delegates suffering from mental fatigue, particularly during long, involved business sessions. Simply being in a natural or country environment can help boost flagging energy. Studies published in the Journal of Environmental Psychology found that people’s mental energy can be improved simply by looking at photos of nature. Plus, natural beauty can encourage creativity and feeling of awe, which in turn can inspire creative solutions. Suggestion: Have tea or lunch breaks outside, so delegates can enjoy the natural surrounds. Promotes stress relief If delegates (or organisers) are feeling tensed and stressed, it’s time to head for the trees (quite literally). Research into ‘forest therapy’ has found that those who spend time sitting under a tree when stressed will likely find decreased heart rates and levels of the stress hormone cortisol. Being outdoors also increased self-esteem and mood. Suggestion: Build in some free time, where delegates can explore the area or have some quiet time on their own. Helps improve concentration Being outdoors and in a natural environment has proven to be restorative, and can help improve a delegate’s ability to focus on the task at hand. Even seeing a nature through a window can help. Plus, research has shown that 20 minutes spent in a park can help improve concentration. Suggestion: Start off the day’s events with an outside yoga class, or see if the venue offers guided walks, runs or cycle routes. Boosts creative thinking Creative thinking helps inspire creative solutions. A study published in Environmental Health and Preventative Medicine found that people who were immersed in nature for four days boosted their performance on creative problem-solving by 50%. This could be due to a combination of increased exposure to nature, decreased exposure to technology and other factors. Suggestion: Impose tech-free down times during the conference. However, also build in time for delegates to answer emails, make important phone calls, or to get in touch with their families. Bush and safari venues offer an exciting (and different) conference experience. 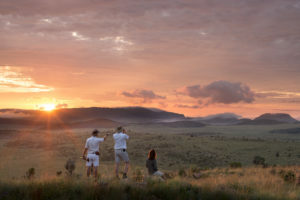 Siyabonga Africa, a family-owned destination management company based in Cape Town, explains that safari lodges and bush getaways are fantastic for escaping the ‘same old conference’ syndrome. The outdoor ambience and seclusion from the ‘real’ world makes this an appealing choice for those who want space free from distraction and a space to contemplate. However, there are certain elements that need to be considered. Firstly, due to popularity of bush escapes, and accommodation capacities, you will need to plan well in advance. Secondly, due to the somewhat remote locations, while there will be standard conference facilities, should you require more technical equipment this may need to be hired in, or may not be compatible with the available technology. But the magic of hosting a bush safari conference is that you can create a truly different experience by incorporating bush braais and game drives as part of the teambuilding activities. It’s safe to say that the pros of moving your conference out of the city are numerous, so make sure to consider a more out-of-the-way venues.